Entries from Digital Intelligence tagged with "gumtree"
MySpace has fallen out the UK's top ten most visited social networking sites for the first time ever, according to new research. The data, from Experian Hitwise, indicates that discovery engine Stumble Upon leapfrogged MySpace to claim tenth place based on web traffic data from November, pushing MySpace down to eleventh. Facebook still dominates the UK social network sector, with nearly 54% of the market share, but YouTube remains the fastest growing, according to new research from Hitwise. After three consecutive months of declining share of visits within the UK social networking market, Facebook picked up again in June, with a 0.11% growth in market share of visits between May and June 2011, Hitwise found. YouTube was the fastest growing social network for the fourth consecutive month, with more than twice as much growth as Facebook during June. 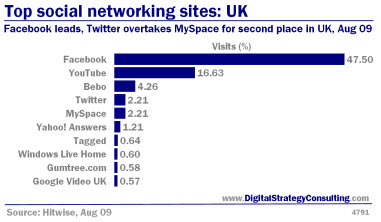 Facebook leads, Twitter overtakes MySpace for fourth place, Aug 09.